The languages accepted by finite automata are precisely the languages denoted by regular expressions. In contrast, finite automata may exhibit behaviours that cannot be described by regular expressions up to bisimilarity. 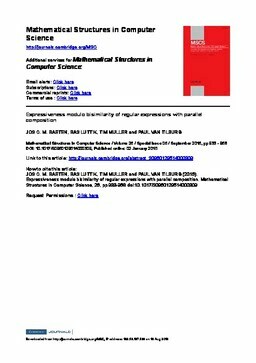 In this paper, we consider extensions of the theory of regular expressions with various forms of parallel composition and study the effect on expressiveness. First we prove that adding pure interleaving to the theory of regular expressions strictly increases its expressiveness modulo bisimilarity. Then, we prove that replacing the operation for pure interleaving by ACP-style parallel composition gives a further increase in expressiveness, still insufficient, however, to facilitate the expression of all finite automata up to bisimilarity. Finally, we prove that the theory of regular expressions with ACP-style parallel composition and encapsulation is expressive enough to express all finite automata up to bisimilarity. Our results extend the expressiveness results obtained by Bergstra, Bethke and Ponse for process algebras with (the binary variant of) Kleene’s star operation.